WELCOME TO THE UW CLASSICS DEPARTMENT'S 2017 SPRING QUARTER IN ROME! This is the home page for the 2017 Classical Seminar in Rome. 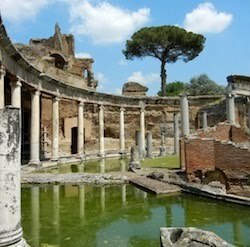 You can find links to the pages for Classics 399/Latin 465 (Roman Topography), Classics 496/Latin 565 (Houses and Villas Seminar) in the sidebar, as well as links to contact numbers and other important information. Please email Professor Topper (ktopper@uw.edu) if you have any questions. The classrooms and administrative office for our program are housed in the UW Rome Center in the Palazzo Pio, which is located in the the historic center of the city. This seventeenth-century structure sits on the foundations of the ancient theater of Pompey, which was built in 55 B.C.E. The Palazzo faces the Piazza del Biscione and Campo de' Fiori, where one of Rome's busiest open-air markets is situated. Since the mid–sixteen hundreds, the Palazzo has housed in succession a family church, an archaeological school, studios for artists, and a small theater. The space is now equipped with apartments, a library, and instructional space. Important reminder: Apartments will open to students on Monday, March 27; please try to arrive at the Rome Center well before 5 PM so that a staff member can direct to your apartment. All apartments must be cleaned and vacated on Friday, June 2, unless you've made other arrangements with the landlord.